A unified tax reform proposal is expected to be released in September which is likely to include details on the impact on the US budget deficit and the economy. Citi expects the tax reform proposal to include a combination of rate reductions, plus increased spending on defense and infrastructure. This is likely to provide about a 1.5 percentage point boost to real GDP growth over four years, with the largest annual boosts taking place in 2018 and 2019, and fading in the subsequent years. 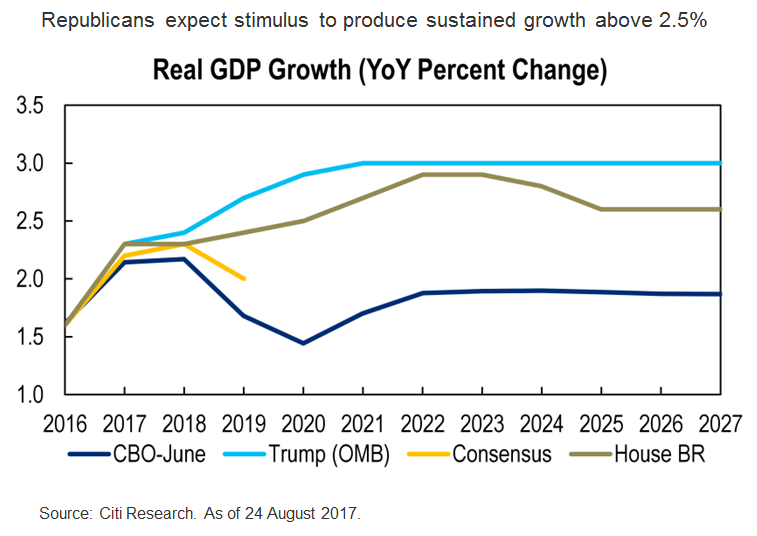 In contrast to what the Republicans believe, Citi analysts doubt that the proposed tax, spending and deregulation proposals can boost real GDP growth to 3% or even 2.6% on a sustainable basis. Citi analysts expect the legislation that enacts tax reform to take place in December 2017 at the earliest and very early in the second quarter of 2018 at the latest. Once in 2018, the focus in Washington will shift towards the mid-term elections, rendering temporary tax cuts with few if any offsets more likely. Republican legislators would likely be keen to fulfill at least one key 2016 campaign promise to draw support at the polls in November 2018 and might strip out controversial measures to garner Democratic support. Beware of tail risks: Congressional and Trump Administration missteps on the US debt ceiling or US tax reform have the potential to roil markets, erode confidence, and/or delay the Fed's monetary policy normalization program.